Looking to build a grid layout in your app? With your data stored in Realm, you can create an interface like this really quickly. Best of all, changes to your data will trigger automatic animations! This tutorial is going to show you how you can use ABFRealmGridController, a specialized subclass of UICollectionViewController, to bind to your data in Realm. If you’re looking for a Swift version, you can check out the tutorial for RealmGridController, which has an identical API. This tutorial requires Xcode 7+. 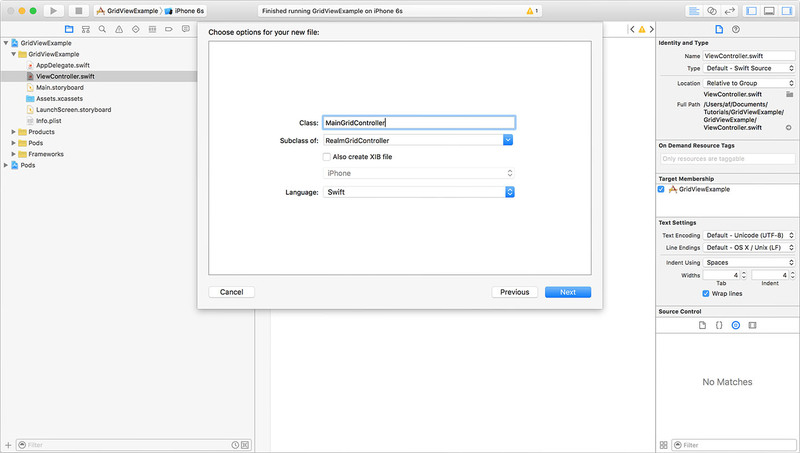 Create a new Xcode project, using the “Single View Application” template. Be sure “Language” is set to Objective-C, and that “Use Core Data” is unchecked. When it’s done, you’ll need to close the Xcode window and open the xcworkspace file that CocoaPods created, so that you can use the classes inside the pods. Now that we have our base project setup, we need to first create a subclass of ABFRealmGridController to allow us to customize its display. Go to File → New → File then click “Cocoa Touch Class.” In the resulting dialog, set the name to “MainGridController” and the subclass to UICollectionViewController (we will update the subclass to the grid controller later). 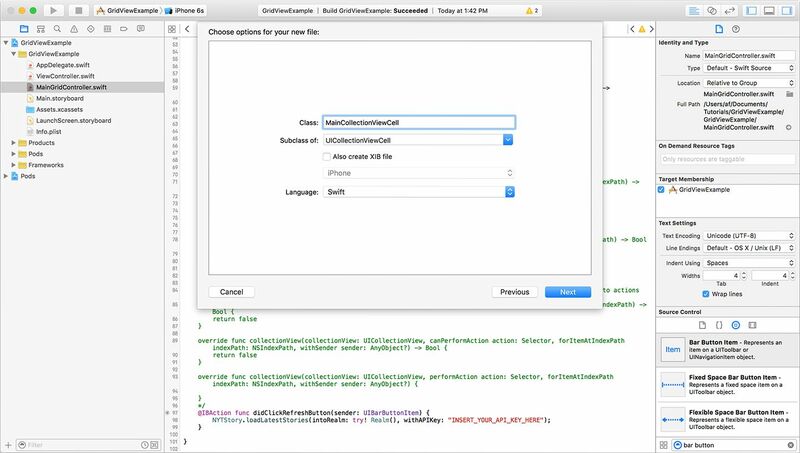 Be sure to leave the checkbox for “Also create XIB file” unchecked and the Language as Objective-C.
With our subclass created, we now have to customize the Storyboard to utilize it. In Main.storyboard, delete the default ViewController scene. Then drag into the scene a UINavigationController and a UICollectionViewController. 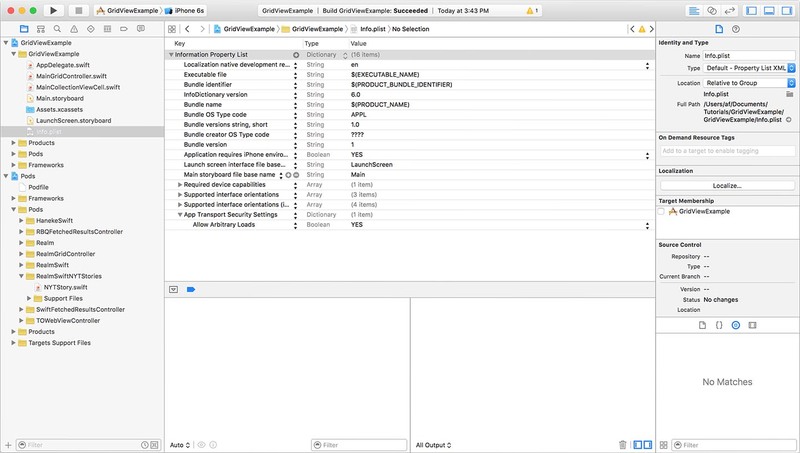 You will have to delete the UITableViewController that the UINavigationController created and change the segue to point to the UICollectionViewController (control-click the Navigation Controller and drag to the UICollectionViewController then select “Relationship Segue”: “root view controller”). For a demonstration of how to do this, check out the first half of the video just below this. With the UINavigationController and UICollectionViewController in place, make sure to set the UICollectionViewController to have a custom class of MainGridController, and set the background color on the UICollectionView to white. Finally, we need to configure the navigation bar within our grid controller. Click the Navigation Item (you can click the navigation bar in the grid controller) and set the title to “Top Stories.” Then drag a UIBarButtonItem to the right side of the navigation bar. Configure the bar button’s “System Icon” to be “Refresh,” then click the Assistant Editor button (it looks like two overlapping circles). Control-click the refresh button and drag into the code file to create an action outlet in MainGridController; name the method didClickRefreshButton and set the “Type” to UIBarButtonItem. Tip: You can now delete the ViewController.h and ViewController.m files as we won’t need them anymore. Now that we have the initial wiring set up, we need to get the data ready. The New York Times offers a great API, and we will use their “Top Stories” API to retrieve the latest news stories and display them in the grid. Recall that during the pod install we added RealmNYTStories. 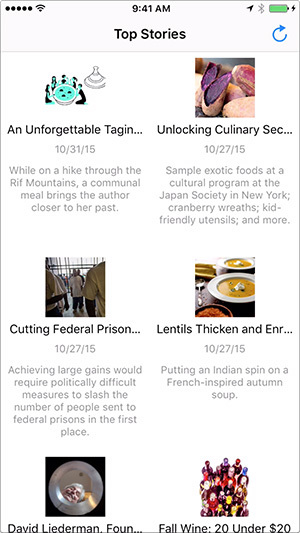 This pod includes two Realm model classes: NYTStory and NYTStoryImage. They represent the data returned from the New York Times Top Stories API. To simplify this tutorial, we won’t go into all of the steps on how to request data from the API and then deserialize the resulting JSON data into Realm objects. Instead, all you have to do is register for an API Key on the New York Times site: http://developer.nytimes.com/apps/register. Be sure to scroll all the way down and check the box for “Issue a new key for Top Stories API”! To load data from the New York Times, the NYTStory class includes a convenience method, so insert this method in the didClickRefreshButton: method that is tied to the refresh bar button. Don’t forget to include your own API key! If you want to see how we handle the data request and JSON parsing, just check out the implementation of this method in NYTStory.m. It performs several async API requests for each newspaper section and parses the JSON response into the Realm models. Now that we have our data model ready, let’s get started on customizing the grid’s look. Since ABFRealmGridController is just a specialized UICollectionView, we will need to create a UICollectionViewCell to display each news story. Go to File → New → File then click “Cocoa Touch Class.” In the resulting dialog, set the name to “MainCollectionViewCell” and the subclass to UICollectionViewCell. Be sure to leave the checkbox for “Also create XIB file” unchecked and the Language as Objective-C.
To layout the elements, we will use Main.storyboard. Customize the UICollectionView by making sure “Items” is set to 1. Adjust the cell size to be 185 wide and 250 high. All the other sizes should be 0. Now drag in a UIImageView and position it at the top. Next, we’ll set up the three labels. There’s a video after this showing how to set them up. First, drag a UILabel and position it below the UIImageView. This will be the title label. Set its font to System Medium 15, and center the text. Finally, drag the last UILabel for the excerpt below the date label. Set its font to System 13 with a hex color of #8C8C8C. Set the “Number of Lines” to 0, which will let the label use as many lines as it needs. Since the label could be any size, based on the amount of text, we need to make sure the bottom constraint has a lower priority to allow it to adjust. Almost done! We have our data model set up, and a custom UICollectionViewCell to display the stories. The last part is to configure MainGridController. In MainGridController.m, set the reuseIdentifier to “mainCell”. Then, in viewDidLoad, we need to tell the controller that we want to bind to the data model NYTStory. Remove the line of code that is attempting to register a cell class; we have already set that up in the storyboard. TIP: You can also set this in Main.storyboard. Select the MainGridController, and the property will be in the right sidebar. This is possible due to the @IBInspectable annotations. This method is where the UICollectionView requests the cell to display. We dequeue a cell with the identifier “mainCell” (recall that we set this in the storyboard). We can then use the controller’s method to retrieve the object at the given index path. With the story, we can now set the various properties of the cell. Note: NYTStory includes a class method to convert the date into a short string. Finally, to handle displaying the image, we are using a simple image caching library called Haneke. Recall that we installed this during the initial pod install. This library makes it really easy to fetch images from the web on a background thread and then cache them for quick access while scrolling. With the cell configured to display the data, there’s only one small step left before the app will work. Starting with iOS 9, we need to make an exception to the App Transport Security (ATS) settings so that the stories can load (by default, iOS 9 blocks all URL requests to non-secure websites). This method informs us when the user clicks a cell, so that we can grab the story based on the index path. With the story, we create an instance of TOWebViewController, passing in the story’s URL string. We then wrap the web view controller in its own UINavigationController and present it. The final customization is to configure the collection view to have different number of columns based on the orientation. This allows us to really showcase the ease of use that UICollectionView offers for grid layouts. This checks if the orientation is portrait or landscape, and if the app is running on an iPhone or an iPad. Based on the configuration, it adjusts the cell width so that they get draw in a given number of columns. For example, on an iPhone in landscape, the column count would be 3. Now your app is ready to go. Simply run the app and click the refresh button to see your stories appear!